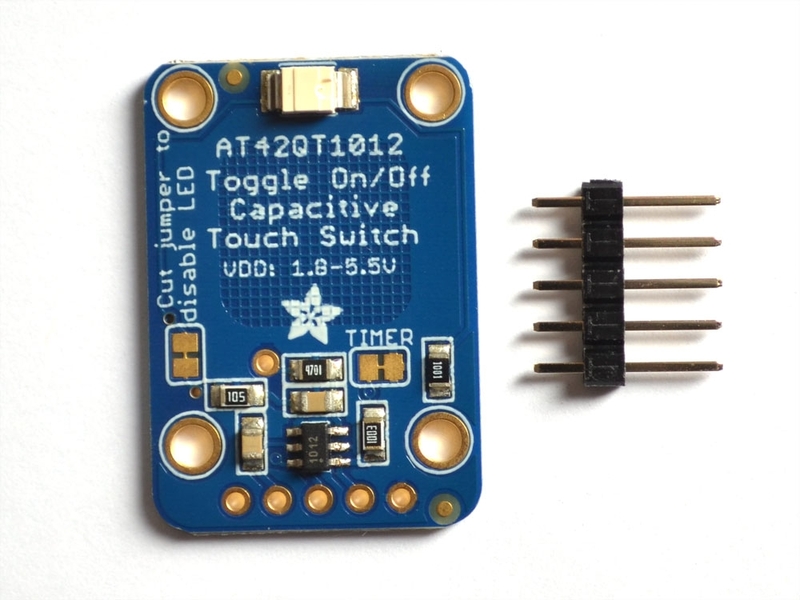 This breakout board is the simplest way to create a project with a single "toggle" capacitive touch sensor. No microcontroller is required here - just power with 1.8 to 5.5VDC and touch the pad to activate the sensor. 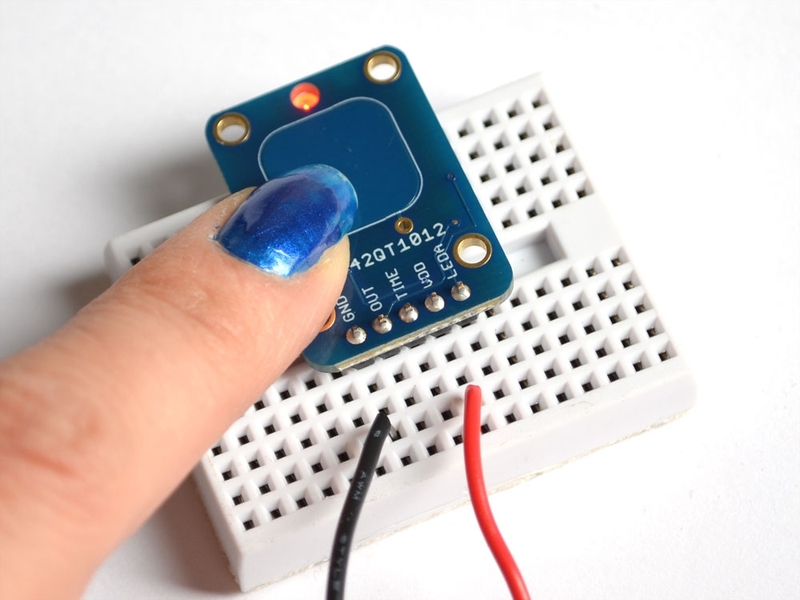 This sensor is a toggle output type: touch-on then touch-off. That means that when a capacitive load is detected (e.g. a person touches the sensor-pad area) the red LED will alternate turning off and the output pin will go high or low, respectively. 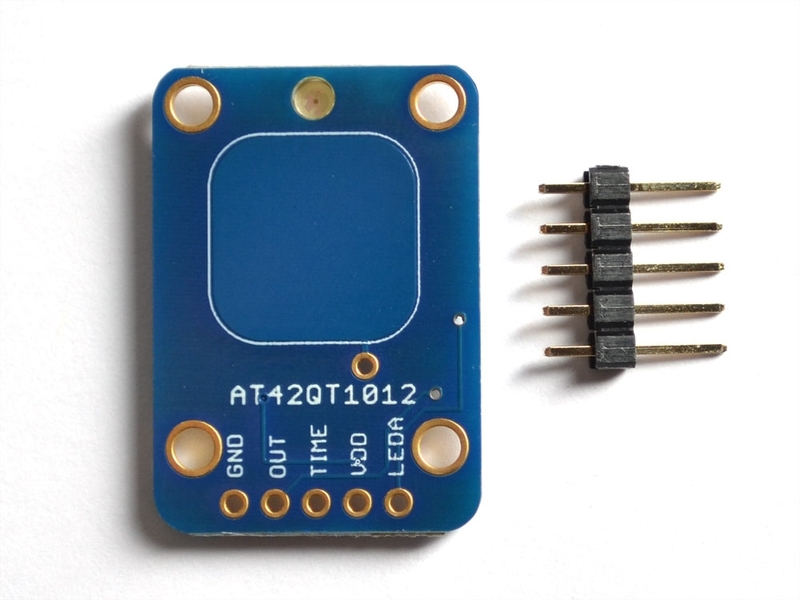 This sensor is good for a project where you want to activate something on the first touch, then deactivate it when touching again, like a switch. You can also solder a wire to the middle pad and create your own capacitive pad if the built-in one isn't suited to your project. If you want to save power, the LED can be disconnected from the output pin (cut the trace between the jumper marked as such). We designed this breakout to have infinite time-out. The chip does support having the sensor time-out, so for example, if something is turned on, it will eventually turn off on its own. If you'd like to use this mode, cut the TIMER jumper and then connect a resistor/capacitor to the TIME pin. Check the datasheet for how to calculate the TIME pin to match your desired timeout. Comes with a fully assembled board, and a small stick of 0.1" header so you can solder and plug it into a breadboard. For additional contacts, we suggest using copper foil, then solder a wire that connects from the foil pad to the breakout. The datasheet has many details on sensitivity, power usage, etc.